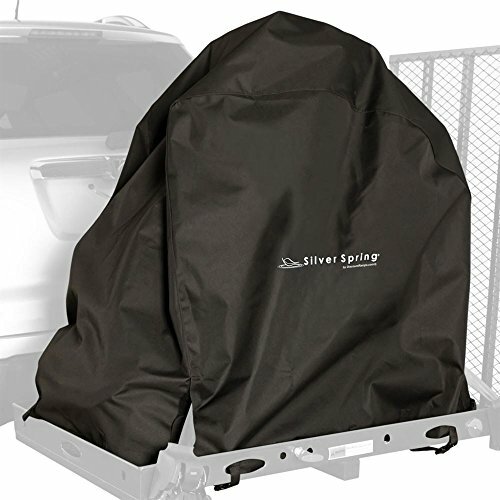 Protect your power chair from dirt, debris and the elements during transportation with the Silver Spring Power Chair Cover. Made from lightweight, durable, nylon this cover features four slit openings for tie downs to keep the cover in place, even at highway speeds. This cover measures 44" L x 23" W x 38" H, and features a rubberized interior membrane coating to keep your chair dry in all wet or snowy weather. The cover has two 1" wide, built-in tie down straps with plastic buckles to secure across the bottom of the carrier, holding the cover in place. Four additional nylon loops on each side give you the option to strap the cover down at additional points. Each corner opens with a 10-1/2" Velcro slit so the cover may be secured over the carrier tie downs for a tighter fit; plastic buckles at the corners keep them closed. The cover has two 1" wide, built-in tie down straps with plastic buckles to secure across the bottom of the carrier, holding the cover in place. Four additional nylon loops on each side give you the option to strap the cover down at additional points.